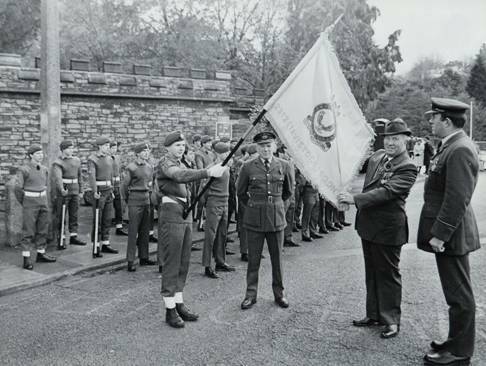 On Remembrance Sunday 1985, 2312 (Tavistock) Squadron Air Training Corps were presented with a new colour by Mr Roy Minhinnick the Chairman and on behalf of the Tavistock Branch of the Royal British Legion. The colours were received on behalf of the Squadron by the Squadron Commander, Flight Lieutenant Derek Bradford and then Squadron Officer Flying Officer John Olver. The colour has been on parade at every Armistice Sunday since, plus numerous cadet parades and banner drill competitions. With signs of wear and tear the Squadron approached the Tavistock RBL to see if the branch could help fund a replacement. The branch found that a specific legacy they had received could be used for the purpose. A new colour was subsequently ordered . 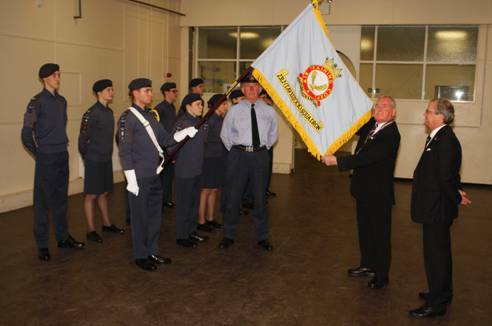 The new colours were presented by Malcom CHRISTIE, Chairman of the Tavistock Branch of the Royal British Legion, and Chris SMERDON, Poppy Appeal Organiser, to the now Squadron Commander, Squadron Leader John Olver who accepted the colours on behalf of the Squadron. Chris thanked the cadets on parade for their efforts in collecting £709 for the 2018 appeal in just one day in Tavistock. It is with great sadness that the Squadron learned of the passing of Flt Lt Bradford just two weeks after the presentation of the new colours.